This is the recipe for our sausage roll filling – this is the one we use at events, from vegan fairs to weddings. 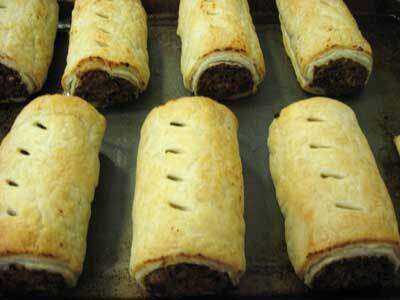 We wrap them in puff pastry, as shortcrust throws the balance out and makes the sausage rolls too heavy. Definitely toast the sunflower seeds as it adds quite a bit to the flavour. 1. 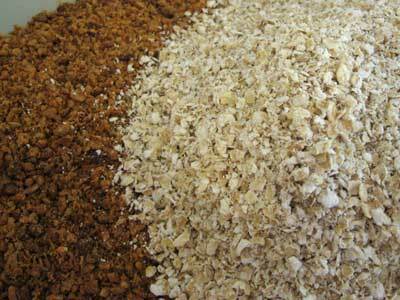 Put sunflower seeds, oats, breadcrumbs, mixed herbs, allspice and yeast flakes into a large bowl and stir well to combine. 2. Add the oil to a frying pan, get it hot, then add the onions. Cook and stir over a low to medium heat for 5 minutes or until the onions start to soften. Add garlic and stir round for a few seconds. Turn off the heat and add the grated carrots. Stir to mix well. 3. Dissolve yeast extract in the boiling water. Stir in tomato puree, mushroom ketchup, tamari and ume plum sauce. Mix well until the ingredients come together to form a mass. You may want to get your hands in to give it a good mix. 4. Lightly oil a large baking tray and preheat the oven to 200C/gas 6. 5. Take the sheet of puff pastry out of the fridge. Unroll it and cut it in half length-ways so you have two equal-sized pieces. 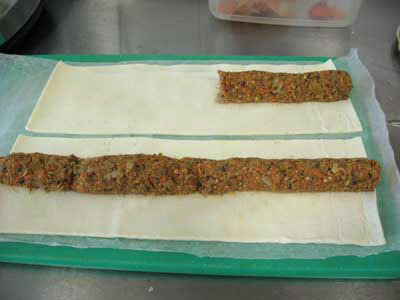 Split the filling into two pieces and roll each one into a long sausage shape that fits along the length of the pastry. See the photos below for a diagram. 6. 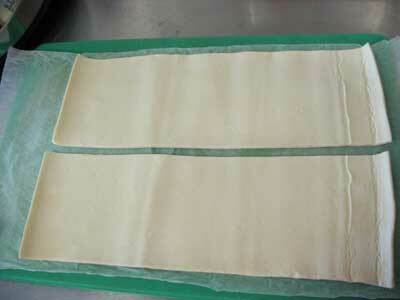 Brush water along the bottom pastry edge, then take the top edge and carefully roll up the pastry. Press lightly to seal. Roll up both lengths of pastry, then cut each length into four pieces (or ten pieces if you want baby buffet sausage rolls). 7. Place the rolls on the prepared baking tray. If desired brush with soya milk – we don’t usually do this. Place on the bottom shelf of the hot oven for 25 to 30 minutes, or until golden, then serve. Seeds ground finely, oats a bit rougher. Toasted sunflower seeds (left) ground finely, and oats (right) with a rough grind. Cut the sheet of puff pastry in half lengthways so you have two equal-sized pieces. 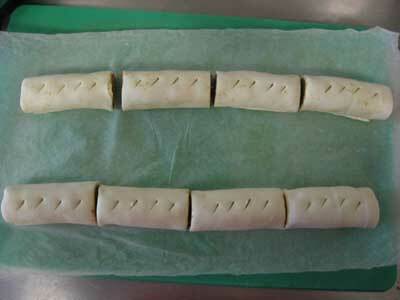 Cut the sheet of puff pastry in half length-ways so you have two equal-sized pieces. 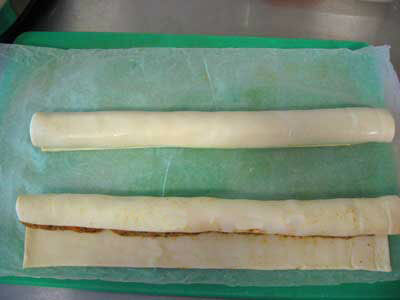 Split the filling into two pieces and roll each one into a long sausage shape that fits along the length of the pastry. You might find it easier to roll the sausage shape in two or three sections and fit them together. Brush water along the bottom pastry edge, then take the top edge and carefully roll up the pastry. Press lightly to seal. Cut each length into four pieces and cut some slits in the top with a knife (or ten pieces if you want baby buffet sausage rolls). Roll up both lengths of pastry, then cut each length into four pieces (or ten pieces if you want baby buffet sausage rolls). We use one 320g packet of Jus-Rol chilled puff sheets, photo below, there is one sheet in a packet. Jus-Rol puff pastry is vegan at time of writing, except the butter puff. You can make and shape the sausage rolls and then freeze them. When you need the sausage rolls, take them out of the freezer and put onto an oiled tray. Leave at room temperature for thirty minutes or so (otherwise they tend to crack) and then cook at 200C as above, they’ll take 10-20 minutes longer to cook through. We have successfully replaced the mushroom ketchup with the same amount of vegan worcester sauce or teryaki sauce. We have not tried replacing the ume plum sauce but if you want to substitute, try replacing with the same amount of lemon juice. Grate the carrots as stated above and then pulse them in the food processor so there aren’t any long bits of carrot.